Thanks to all who sent their results in for the RSPB's Big Garden Watch yesterday. The great news is that each year - more of us take part. But the sad news is that for the 5th year running the numbers are declining. The Olympic construction has got to be a major factor in the decline. In a few weeks - more mature trees are going to be cut down. As I look out of the window at the doomed trees - I can see at least 3 nests that are going down with them. But - we can try our best to rehouse some of the birds that will be homeless soon. Please see if you can stick up some more bird houses all around Leabank Square. If you have cats - please make sure that the boxes are well out of reach. And please hand as many fatballs as you can. Both the Poundshop & the 99p shop in Stratford sell them very cheaply, so if you have a few spare pounds, please pop into them. No sparrows at all this year - after the huge success last year - but then they lost their large brambles. If you still have any more figures - please add them through the comments - or continue sending the email forms. It's Sunday. Our only day to escape the horrendous noise from our ASBO deserving neighbours - the Olympics. So what do they do? They start working on the ring road 5 metres from our bedrooms early in the morning!! Then the priceless 'hotline' answerer saying 'sorry' like she really meant it. But still took her time getting back to me, so I had to hurry her along, and all she did was pass some of the situation on to 'someone on site' - who had to call me in order to find out what's happening. Then she called back about half hour later - to tell that they will be 20 more minutes!! And that she will pass this all on to the 'community relations team' - which means that they weren't even notified all along?! Hey!!! Olympics!!! We are part of your community - relate to us!! Keep your eyes peeled in the Wick this winter, as you may bump into a very colourful group of visitors, with distinctive hairstyles! Waxwings have been arriving on the British Isle since the beginning of winter and many avid ‘twitchers’ have been reporting sightings all over the UK. These birds migrate from their breeding grounds in Scandinavia and usually arrive in the north and gradually filter southwards. However, this years’ migration is particularly exciting, as waxwings have arrived en masse across the north, northwest and eastern coast of Britain. We had our first sighting of these delightful birds on Monday morning. Whilst taking the children to school on the bus, we noticed a large group of birds circling and then settling in a whitebeam on Wick Road. Even though we could only make out the birds’ silhouette; it was clear from the waxwings’ distinctive crest that we had stumbled on something special. Cliff Richard Gig in Hackney Wick?! Fiona has just sent this invitation to all of us to join these artists in Hackney Museum this Saturday. Some of went to the last one a few weeks ago - and this one promises to be even better! Please come along - you'll be gutted if you miss this! What can you tell us about the canal? Come and meet Chris Dorley Brown, Jessie Brennan and Daniel Lehan who are creating new artworks about the canal. The event starts with a film screening which includes rare footage of Cliff Richard and The Shadows’ visit to Hackney Wick in the 1960s, plus scenes from Lesney Toy Factory, Hackney’s first computer pub, Kingsmead Estate and the Trowbridge blowdown. 11am to 11.45am. Three artists and a team of local volunteers are exploring the Hackney Cut, or Lea River Navigation Canal , and the industrial, physical and social history of Hackney Wick. By collecting stories (up to the present day) from the people who work and live alongside the canal the project will document the importance of The Cut to the community in an area undergoing huge change. But the section from Thames Water was definitely more inspiring. As we should all know by now. Mainly because of last summers huge burst water pipe - Thames Water are replacing the water main along the tow-path. So the huge plastic pipe you can see just inside the electric fence at the moment - is going to temporarily pump water for Hackney Wick. Meanwhile Thames Water get on with digging up the old Victorian pipe that burst - and replace it with some kind of super longer lasting one. But in the course of digging it up - all the trees & vegetation that are left after the Olympics cut last them down - are definitely going to go! There is no avoiding this unfortunately. The Thames Water guy was most apologetic. As compensation for this - and the noise & dust crated in the digging - he promised to replace the trees - like for like - and as close to where they were as possible. Of course - they will be nowhere near as mature as the ones going, but it was a start. I then begged - yes - begged him to plant even more trees than they chop down. Naturally - put on the spot - he didn't commit to anything - but made the right kind of noises for me to believe that he might consider our begging. The absolute sheer ugliness of the Olympic Media Centre needs to be hidden from view from Leabank Square in years to come - but the sooner the trees are planted the sooner we can camouflage the media centre. Richard suggested a line of beaches - which sounds like an excellent idea. They grow reasonably quickly - and can get quite tall. Could be made into quite a feature in years to come. Anyway - please comment on this situation - and I can pass them on to the very nice man from Thames Water. Remember how excited we all were last summer when we heard that Atlas Wharf (next door) might be turned into an arts centre? Then remeber how dissapointed we were when it didn't happen? Well - it's only gone & moved a few doors down!!!!! The Hackney Wick Arts Centre will now be downstream round the bend of the canal - right next to Whire Post Lane. (Where Banksy's Baby is). And the architect we were all rooting for won it!!!! Yes - David Kohn! If you don't exactly remember the name - his was the only one to include the floating garden. This means another one of our neighbours who is actively encouraging the biodiversity of the canal in this Hackney Wick stretch! This is not only great news for all the fish, geese, coots, dragonflies & frogs - but imagine how much more beautiful our walks along the towpath are going to be. Well done David! We always knew your design was the one that had Hackney Wickers best interests at heart. The balconey on the road side is cool too - but we LOVE the floating garden most! Of course - we know it's also the art & events happening inside that's just as important - but we LOVE the floating garden the most! And then there's the seated are on the river bank - but we LOVE the floating garden the most! A very belated Happy New Year Derek, let's hope many good things come true for all of us this year!! I trust you are well & in fine fettle - besides the inevitable round of flu's - all of us are great. Derek - I remember you once telling me that there is a policy about trees & shrubs not being allowed to grow above a certain height. The Leabank Square Gardening Club are asking me to get some clarification about it. One of the results from the last whole of Leabank Square consultation was that many residents think it lacks a few trees. Walking around every single estate in our neighbourhood, you can see exactly what they mean. Every square, estate and new development has quite a few trees providing greenery, shade, shelter, oxygen, peace and all the other hippy things you would expect me to say. But Leabank Square only has the one London Plain tree in the north-east corner (which you hard-prune every couple of years, and the few fruit trees near the entrance - which we prune. So - I guess what people want to know is - why are we not allowed any on the green - and why are the few existing evergreen shrubs severely stumped a few times a year? Of course, if there are sound lawful reasons for this - no worries - but how come all the surrounding residents have beautiful mature & stunning trees. And continue to plant even more. Derek - I may have misunderstood you when we last spoke about this matter - so if I'm barking up the wrong (ahem) tree - then please put me straight as well. Soon as I get a reply - I'll post it up here. More Olympic Trees to be Cut Down? Thanks to T who alerted me to this new threat to some more of the trees kidnapped by the Olympic Park. A circular from Thames Water was apparently put through each door of the terraces, but some of us in the flats never got them. Due to the huge burst water main last summer, Thames water are going to replace some of the section of water main directly opposite Leabank Square, but just inside the Olympic Electric Fence. This is where many of us planted the orchard all those years ago. Of course, all of the fruit & nut trees were chopped down by the Olympics, and now the few remaining trees look like they are going to be chopped down by Thames Water when they replace the mains. 2. This could possibly open the way for the Olympics to build on top of the newly strengthened water mains. The only reason that there are no planned developments right up close to the river on their side - is because the water mains are ancient & fragile. By replacing them, there is the possibility that they will now be strong & sturdy enough for housing or industrial developemnt to take place. We all know exactly what we think of the horrible blocks of steel & glass we already have to stare at - but if even more are built even closer to the river - we will be overlooked by a soviet style cliff face of hideousness. I will do my best to find out more through the Hackney Wick Partnership - but please ask as many questions as possible wherever you can - councillors, MP's, mayors, ODA spin doctors. etc. As requested through the last survey, I have sent an email to Derek at PMMS asking about relaxing the 'no tree' policy for Leabank Square, but in the meantime - take a last look at some of the ones you planted across the river, they won't be there for too much longer. Just spoke to the Hackney Council 2012 team, and they assure me (in the 90's percent) that there will br no development up close to the electric fence part of Arena Fields. This area is still planned for the Gainsborough Playing Field & wider tow-path green. As for the trees - we will definetly lose them. What we need to do is insist that some non-invasive replacement trees are planted back all along the pipe. Thanks for the questions everyone - I'll try & squeeze as many as I can in - but they're quite stingy with the amount anyone can ask. I'll get some on their own for any questions I miss. There are a group of us who have been tasked with looking at the 'edge' between Hackney Wick, and the Olympic Site across the canal, and considering the role of architecture in that place, now, and in the future. I will be in the area on Tuesday (18th Jan), and was wondering if anyone from Leabank would be available for a chat? It would be great to find out a bit more about you, and your thoughts on where you area and what's happening around you. Sorry about being so grumpy to you guys who phoned & knocked early this morning. I eventually got hold of someone on the 'hotline' and passed on my grumps. I still haven't heard what the hell it was all about, but it must have been one of their so-called 'emergency works' to have got the diggers & tippers out. I guess the spotlights were coming off the machinery itself. Nonetheless, it was all completely unacceptable. They are not allowed to start work at 5am, and we are entitled to sleep until 8am if we need to. I'll send an email to Judy King, but she has been 'looking into' a few previous things for a while now, so don't hold your breath. Again - sorry about the shortness of the conversations, I'm not too sociable at that time of morning. I understand that you contacted the Construction Hotline early this morning to report machinery making noise on the Olympic Park. We have investigated this issue with the teams onsite. The contractor had planned to use some VCBs (the concrete vehicle control barriers) to create an exit off the main loop road within standard working hours this morning. An inspection of these barriers was carried out early this morning and it was found they were unstable and required additional work to make them safe before they could be used for this purpose. Due to the nature of the issue it was necessary to carry out these emergency works early this morning before the roads on site opened to traffic. As such we were unfortunately unable to notify residents as we normally would. I apologise that these works caused you disturbance. If you experience any other issues related to the Olympic Park development please contact the Construction Hotline on 08000 722 110. Many of us know Dave Hill from his visits & links to our blog. Well.... he has only gone & awarded us this months 'Top Blogger' spot!!! And this after snow, festivities & baaaaad flu have forced us off the blogosphere for too many weeks!! Anyway - after this award, our hit rate has gone bananas, and we are now fielding many more enquiries about Leabank Square. 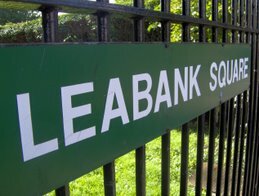 Quite a few of them are of a property enquiry - so if any more residents know of flats or houses coming up for sale or rent here in Leabank Square - please let me get them in touch with you in the usual ways. Dave - thanks a bunch for the award - we really do appreciate all the support you've given us over the years - and long may it last.